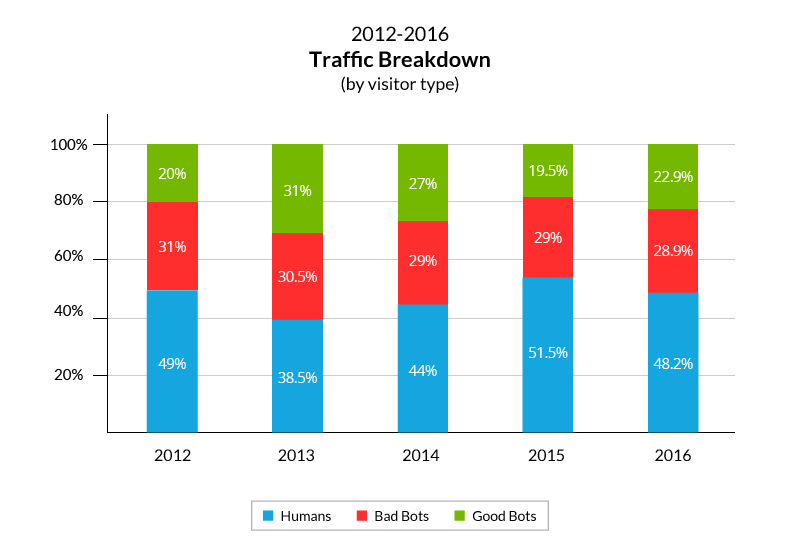 In 2016, humans were just under 50% of web traffic, and the rest of the traffic was from bots. This isn’t necessarily a problem; in fact, that’s how the web has been designed, quite intentionally. For decades, useful site crawler or spider bots for search have helped us categorize the web, making sites and their content searchable down to the most minute detail. They also alert us to price changes on our favorite ecommerce or airline sites. Other types of good bots are transactional bots, informational bots, and entertainment bots. These categories of bots help automate business processes, publish news and information, and play games or become gaming personas. They take on repetitive, time-consuming tasks that either humans don’t want to do or could not do in the same amount of time as a bot. The web wouldn’t be what it is today without good bots…nor would it be the way it is without the bad ones. Bad bots are rarely useful or productive. Bad bots are built for nefarious purposes, almost always to the advantage of the bot controller and the disadvantage of the website affected. These bots include impersonators (the cause of most DDoS attacks on websites), scrapers, spammers and hackers. Recently, as we’ve all come to learn, bad bots have been highly engaged in worldwide political processes, particularly on social media including Facebook and Twitter. Armies of bots, created to look like everyday people, infiltrated the social networks and promoted various political viewpoints. Russia has been proven to be behind not just U.S. bot attacks, but those in other countries and electoral systems as well, but there are undoubtedly plenty of other players in this game, given the high stakes involved. Nearly every website has fallen prey to some kind of bad bot. Fully 97% of sites with unique content or product information have been hit by a scraper bot. These bots take that information and turn it into another site, other types of content, or something else that benefits the bot creator/manager. Most sites have also been hit by bots trying to maliciously log in to or sign up for the site. By 2021, cybercrime damage is estimated to be at $6 trillion, with the cybersercurity products and services industry growing to $1 trillion in revenue. Large businesses have entire departments devoted to preventing, detecting, and recovering from cyber and bot attacks. Small businesses should do what they can to prevent their sites from becoming compromised, including keeping website software up-to-date, using two-factor authentication where possible for logins and passwords, and by blocking common bots from accessing your website. But wait, you say: are all bots bad? Definitely not! Many are currently being used for good, and many, many more are under development and will change the world over the next decades. Good bots fall along a continuum of bot intelligence and usefulness. 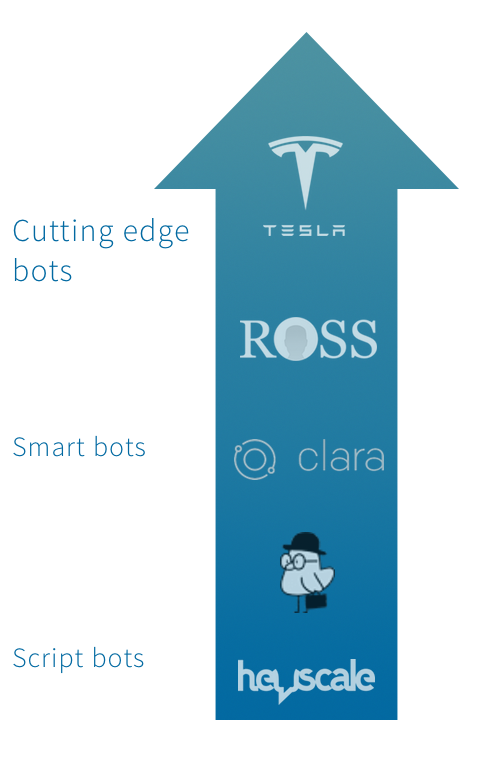 In the center of the scale, smart bots are mostly voice and messaging bots. You may already have one or more of these in your home, office, pocket, or wrist….say hello to Alexa or Siri. They use machine learning and artificial intelligence to answer questions and provide information. At the top of the scale are bots that are much more autonomous; they’re often called intelligent agents. These are the bots that control cars (like Tesla) or provide extreme data analysis (like IBM’s Watson). For our purposes today, we’re going to talk about the bottom of the scale, script bots. These are the bots that you’re likely seeing pop up everywhere from Facebook to your favorite airline website to every software startup you’ve ever visited. The good news is that you can have one (or more), too! Chatbots are services powered by rules and/or artificial intelligence, built to live in major chat platforms (Facebook Messenger, WhatsApp, Kik, Slack) or on your own website. Chatbots usually have a distinct purpose and capability, including bots that can tell you the weather (and related implications), bots to help schedule meetings among multiple people, bots to assist with shopping online, bots to encourage good personal finance habits, and bots for customer service and sales. The two primary types of bots are rules-based and machine learning-based. Rules-based bots are sort of “dumb” bots: they can only respond to specific commands, and they are completely programmed. These bots, while limited, are very easy to implement and use, and can be free or very low-cost to create. Machine learning-based bots are much more sophisticated. They rely on artificial intelligence, and many of them can learn and grow over time by expanding the information they understand and can process. Chatbots are on the rise because our preferences as consumers are changing. More than half of consumers expect answers from companies 24/7, and nearly half prefer contact through messaging versus email or the phone. Competition for chatbot platforms is growing; of course Facebook currently dominates, and would like to remain the leader, but as the industry is still rather new, it remains to be seen if they can hold on to their lead. Nevertheless, 1.2 billion people use Facebook Messenger monthly, so that’s a pretty good start for the social media giant. Businesses can create bots within Facebook or other common social messaging apps, or bots for use on a corporate website or within an app. When considering a chatbot, businesses should consider their audience. Millennials love them, but not all audiences will respond to or want to interact with bots. Chatbots will also shift traffic and customer use from a company’s branded mobile app to the bot platform, assuming it’s elsewhere (such as on Facebook Messenger). Therefore, development resources might get stretched or need to change. When creating your first business bot, don’t overcomplicate it. Use the bot to solve for one key task or set of questions. Make it part of your overall marketing strategy – for customer service, for example, it should be easy to jump from bot to human chat, voice, or email (and vice-versa), instead of the bot standing alone. 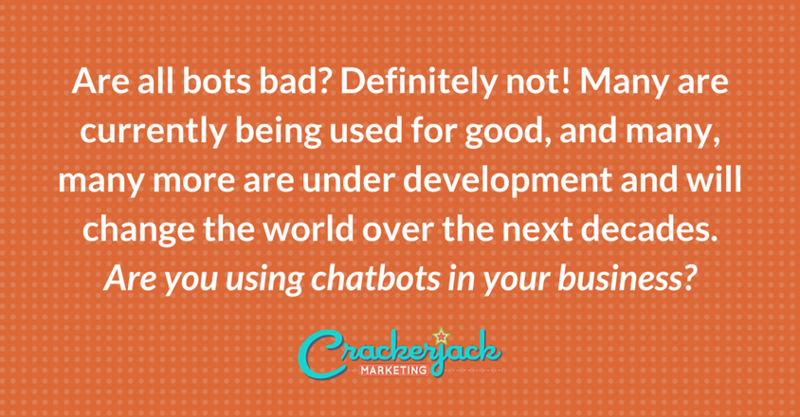 Murray Newlands, a bot guru, suggests that you treat your bot like any other marketing project or tool. Create a strategy to market it, communicate its value to your customers, and devote the right amount of resources to it. He also suggests that you give your business chatbot a unique name and personality, and that it shouldn’t be overly pushy or sales-oriented. Lastly, as with any other tech project, be sure to test your bot extensively. Are you ready to get started with your first chatbot? Implementing some types of bots is so easy, you can do it in an afternoon. And if you’re primarily interested in customer service and sales, two bots you should investigate are Intercom and Drift. These ready-made bots integrate smoothly into your website and provide 24/7 communication with your company. You can see how Drift looks on our agency website; we get a couple of inquiries a day about our services, our blog, and our editorial calendar template. Most of these bots are somewhat pricey, though for large companies they’ll likely reap savings versus customer service staff. 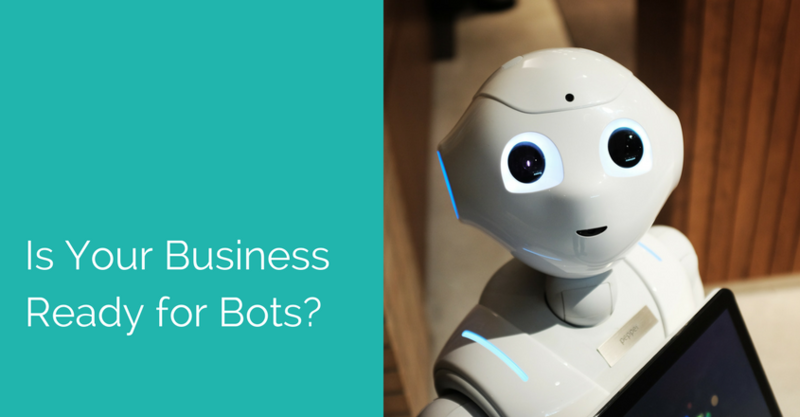 Are you using chatbots for business now, or do you plan to? Reach out to me on Twitter and tell me about it, I’d love to know more. I really think we’ll see a lot more bot marketing in the near future!